For a mental health emergency, same-day consultations are available at the CAPS Uptown location, Monday-Friday, Noon - 4:00 pm. The office closes at 5:00 pm. Please arrive no later than 4:00 pm to allow time to complete the necessary paperwork. For any emergencies at any time, you may call TUPD the directly at 504-865-5911. When you encounter a challenge and don't know who to turn to, call SRSS. During business hours, you can call SRSS at 504-314-2160. For support 24/7, you may contact an SRSS Professional On-Call at 504-920-9900. Here when you need it. 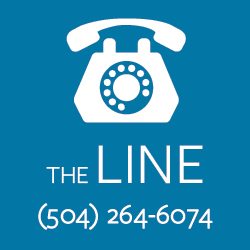 Call The Line, 24/7, at 504-264-6074. When students want to talk to someone right away, you can call our crisis line, any time, day or night, for confidential support. Call The Line, 24/7, at 504-264-6074. Learn how you can call a nurse. Domestic Violence National Hotline: 1-800-799-7233. Click image to view as a PDF.